On some baby topics, I could be mildly classified as a moron. I've never done this before so clearly it's all new which makes me feel a little better. But Kennedy is WAY behind in how many foods I've introduced to her. I assumed since she didn't have any teeth that she couldn't eat almost anything unless it was mushy or she knew how to gum it before swallowing, like Cheerios. And I've only been giving her little bits and have been breaking it into pieces for her. I've never made it a meal or required her to chew off pieces of something. 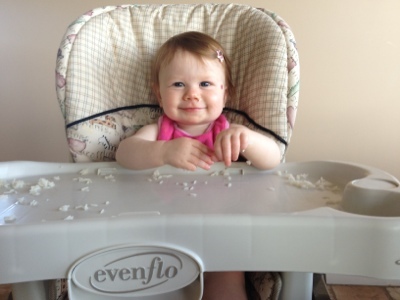 I assumed she was supposed to have the Gerber meals three times a day until she grew teeth. Apparently that's not the case and I've wasted months on introducing foods and having her eat what we eat. I wish I would have known that, I could have saved some money! Anyway, operation feed-Kennedy-normal-food is under way. I'm going to try and give her what I'm eating every day if she's able to eat it. She only has two more months until she's done with formula (thank heavens!) 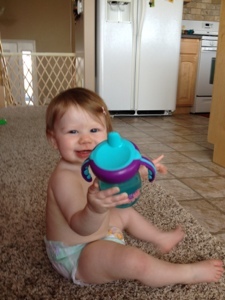 and she'll need to use a sippy cup, which I've been bad at using also. Man I'm a bad mom!! Anyway, tonight's first experience was rice. 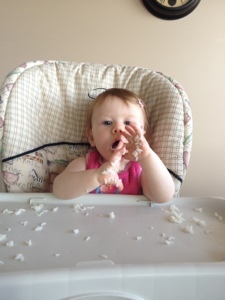 She mashed her hand on it and was tickled that it all stuck to her hand. 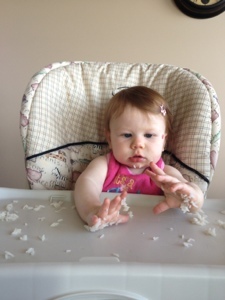 Then she waved her hand all around and flung rice all over the place. She mashed it in her hands and clapped her hands then flung them around again. I think she took about 4 bites max. But hey, I'm finally trying!! 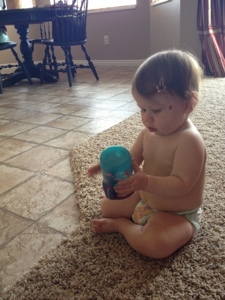 She currently has a sippy cup of water in her hand and is sucking on the bottom... We have our work cut out for us.